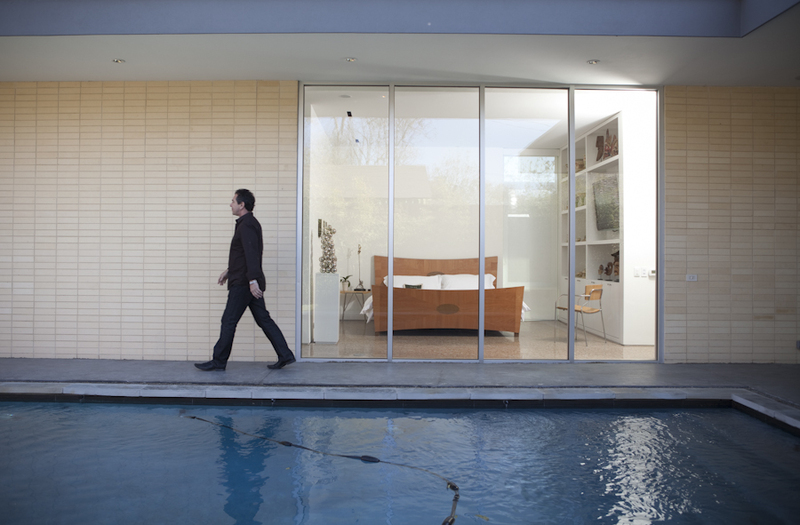 My story on Alan Kagan's house also appears in the Jan/Feb issue of Modern Luxury Dallas. Think Big, Build Small . . . Alan Kagan’s new contemporary house in East Dallas drew plenty of oohs and ahhs on this past fall’s AIA Dallas Tour of Homes, and that’s just what the 30-year veteran of the construction industry wanted. At 2,500 square feet, builder/contractor Kagan’s house impresses not with size, but with innovative and luxurious use of commonly found materials and judicious use of space. 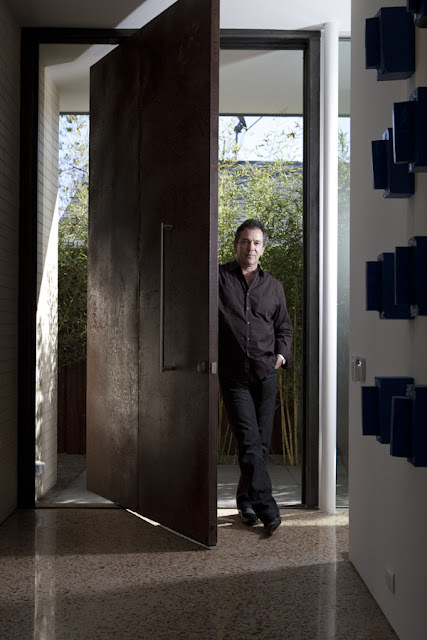 “It’s a great size,”says Kagan, who teamed up with architect Joshua Nimmo of Nimmo American Studio, to build a house for himself that would also be a showcase for future contemporary homes he hopes to build with Nimmo and other architects. He moved in this summer. After working with Nimmo to build edgy, contemporary condominiums geared for young professionals on Rusk Street near downtown several years ago, Kagan identified an untapped niche in the local housing market. While there are plenty of townhouses and condominiums, “a lot of young professionals are wanting modern, affordable and sustainable single family homes that are close to urban areas, but there’s just nothing out there,” he says. Entry level homes, which Kagan builds under the name “Dwellings...a Kagan Company”, start at $300,000 and top out at $750,000. 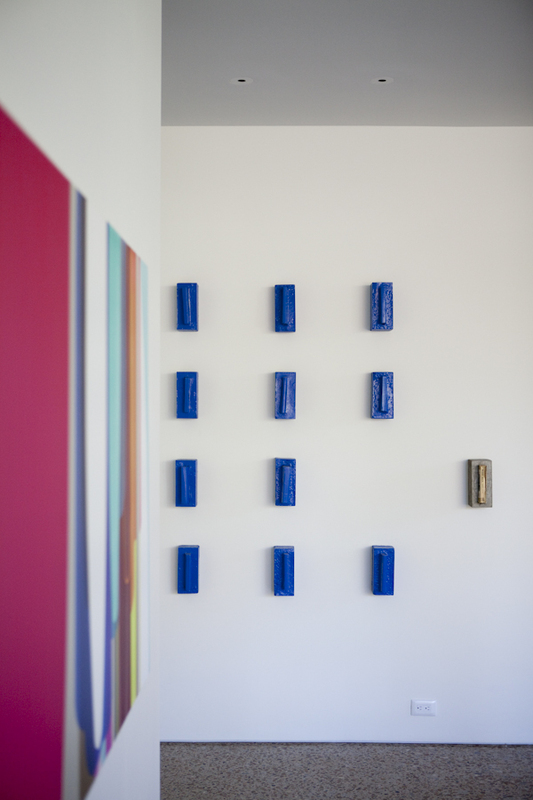 At left, metal sculpture is by Dallas artist Shane Pennington. “I knew I would be living in this house, but the idea was to show potential clients what I could do; we’ve had quite a few see it already. There’s a definite trend towards modern home living in Dallas.” Set along a leafy street several blocks from Greenville Avenue, and surrounded by modestly sized older homes, Kagan’s house stands out with its clean lines and simple geometry. 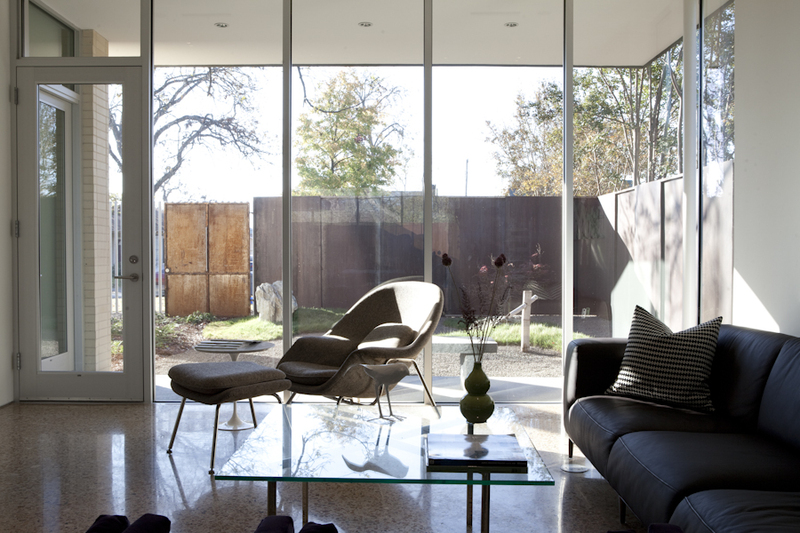 A large architectural metal screen obscures the building from the street, enclosing an old pecan tree and zen garden in the front (Kagan worked in Japan for several years and always wanted one). While the exterior materials—brick and masonry—are typical, the design is not. Using solar orientation software, Nimmo and Kagan determined the best places for windows, overhangs and landscaping. 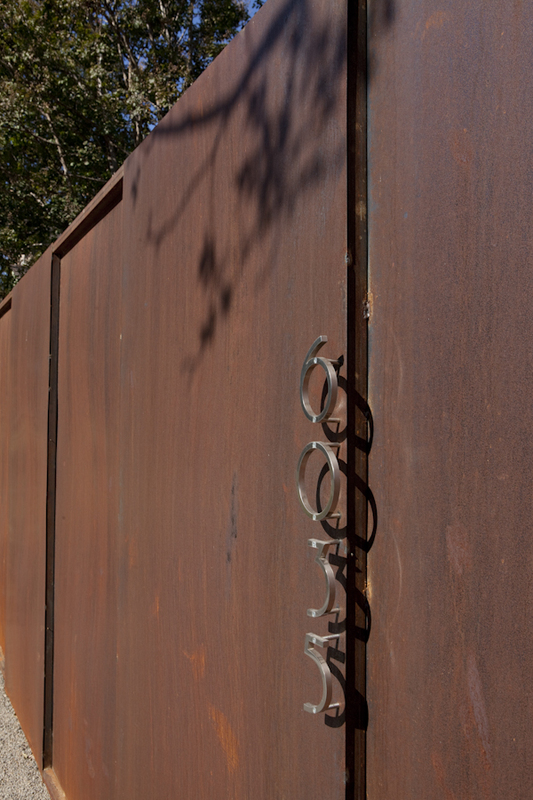 The main entry is on the side of the house under a shady overhang, and accessed by a 10 ft. custom made metal door. Inside, it’s all about expansive spaces and cantilevered planes that provide uninterrupted views from the front to the back of the house. Interior doors are all 10 ft. tall, solid core wood. It’s a small house that feels big. 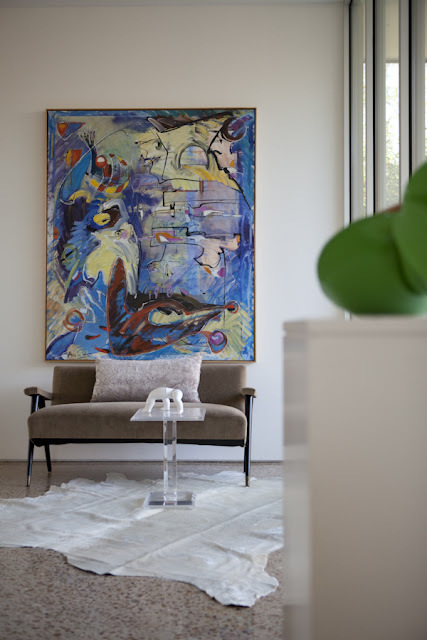 Growing up in Preston Hollow, “the land of the traditional home,” Kagan says, he remembers driving through other neighborhoods in the family car, noticing “all these cool houses with flat roofs and gravel on them. I was taken by midcentury architecture.” He aspired to be an architect, but circumstances pushed him into the business world instead. 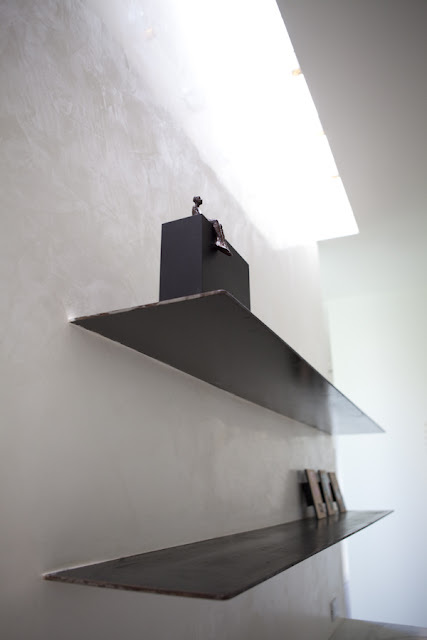 the walls are Venetian Plaster. the work area naturally and spectacularly, doesn't it? 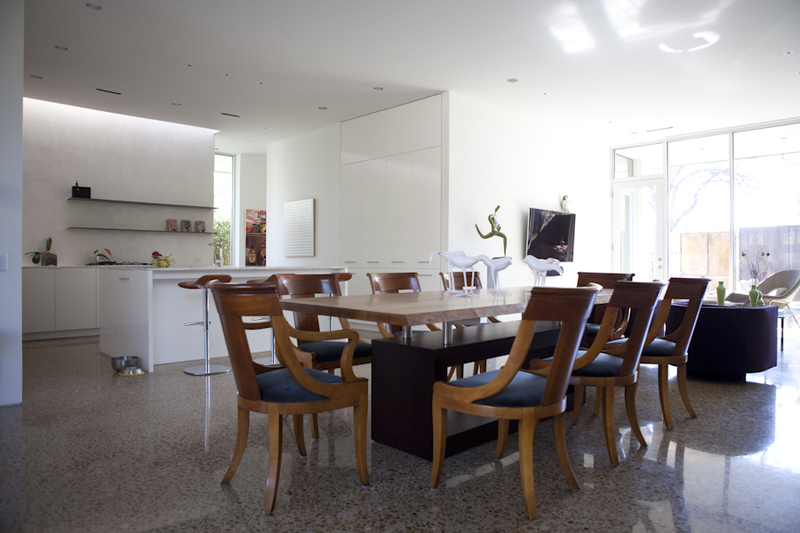 The floor, a colorful aggregate that resembles terrazzo, is actually sanded concrete. that great concrete bench outside is from Joel Cooner Gallery. 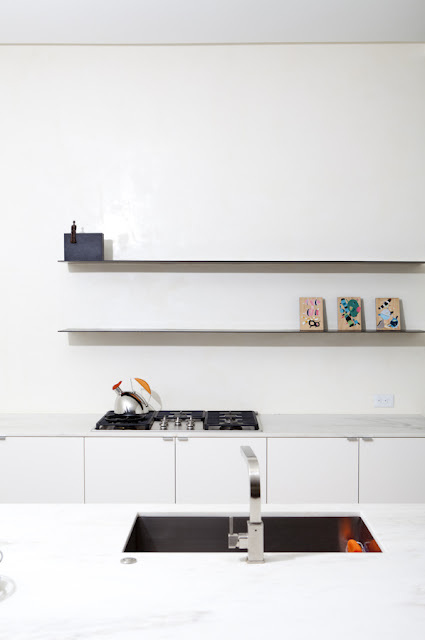 He also has an eye for designing killer minimal kitchens and baths. “I wanted a ‘wow’ master bath,” says Kagan, who charged Nimmo with creating a spa-like, oversized room where everything except the tub and sink is hidden, and an outdoor shower is visible through the glass. The open kitchen glows with polished Venetian plaster walls and a cooktop that’s lighted indirectly by means of a recessed skylight. Integrated fixtures and lack of upper cabinetry minimize visual noise. 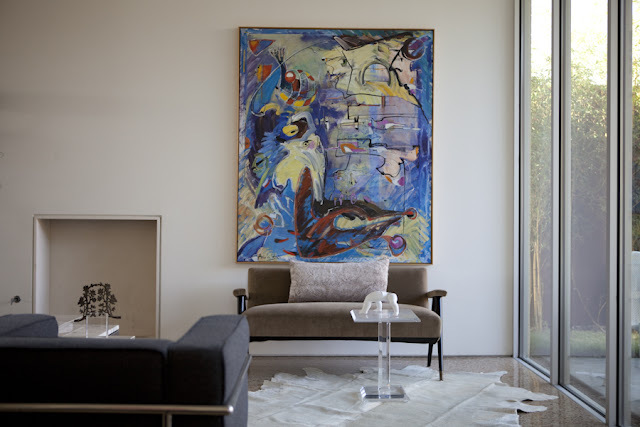 Interior designer and friend Brant McFarlain helped Kagan purchase furniture for the home, and sent a few existing pieces out to be recovered, but Kagan used restraint. 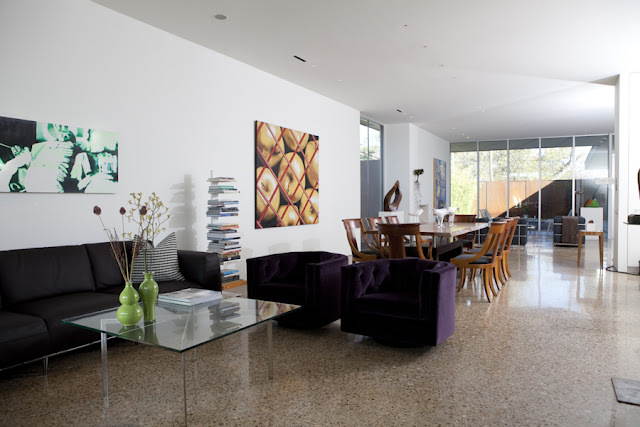 “I tend to be a minimalist, the more stuff you have takes away from the beautiful architecture. Just keep it clean and simple,” he says. Color comes mostly from the sanded concrete floor, which reveals the material’s natural aggregate and resembles terrazzo, but with a lesser price tag.